First off we'll start by saying that Masha Qrella's debut album "Luck" from a couple of years back has been one of the most overlooked albums we've ever stocked - and yet every single time we play it in the office or the shop people stop to ask what on earth it is and how they go about getting their hands on it. Perhaps Masha qrella's unusual name goes some way to explain why her miraculous, addictive debut album didn't quite become the crossover hit so many tastemakers expected it to be, despite it being regarded by many as the most refined and timeless indie-pop albums of the last few years - a constant favourite with virtually anyone who's heard it including some of the bands that Masha Qrella has recently supported : sonic youth and calexico amongst others. For us, their new album "unsolved remained" is one of the most anticipated releases of the year - masha's songs remain more important than any obvious demonstration of (plentifully available) production skills. The key here is her incredible songwriting and perfectly judged delivery - distinctions between electronic and acoustic elements scarcely trouble the listener as you realise you've barely had a chance to absorb each of these songs before they become an entrenched part of the psyche. But some room on this record was handed over to other musical voices as well. The snapping and crackling rhythm track on "vertical destination" was programmed by Berlin sound/visual-collective Rechenzentrum. Similarly, the laconically dragged-out backing track of "I can't tell" was created in the laboratory of Swedish Henrik Johansson - better known as smyglyssna. Finally in the four-and-a-half minute long "C.Bones" a sample of ISO 68 finds itself respectfully integrated into the logic of Qrella's songwriting. 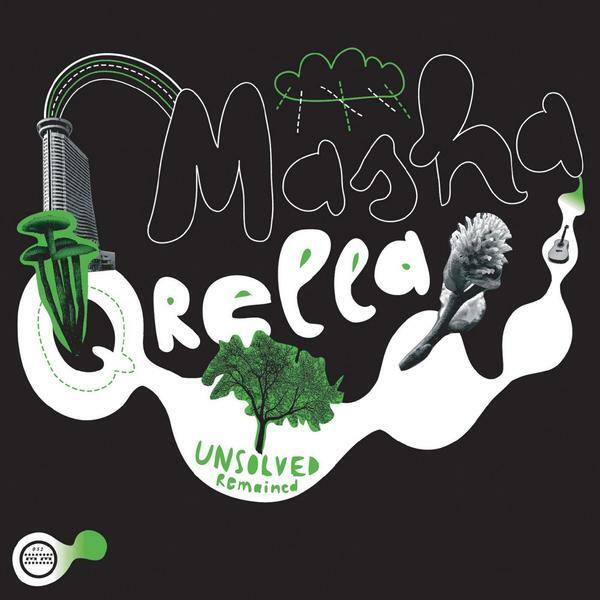 "Unsolved Remained" individually and uniquely continues to formulate Masha Qrella's world of sound, warmer, more confident and multi-layered than its predecessor, with a production that gives these 11 songs, written by one of the most interesting songwriters of her genre, proper density as well as space. We implore you all to check out this incredible album, melancholy yet feelgood in the most contagious sense, surely one of the records of the year.